Downtown burger shop Established in 1934. 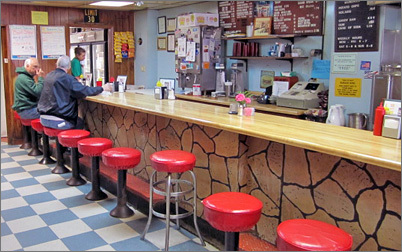 A Green Bay staple, Al's has a lunch counter, a couple booths and offers their homemade cornbeef hash, soups and lunch specials daily. Al's boasts they have the Best Burger in Town. I recommend Al's to everyone who visits GB. If you want a high-end dining experience then go somewhere else. If you want to kick back with coffee, a newspaper and great breakfast or burgers, go to Al's. I've not had a better burger anywhere in this country. The corned beef hash blew my mind the first time i had it years ago and it's still excellent to this day. Staff is super-friendly. Prices are good. What i really live about this place is you are just as likely to run in to the Mayor or a doctor as you are a family of 4, a couple mill workers getting their fill or a group of college kids. A sure sign of a great meal. Be warned, they open early and (5? 6?) and close early (2 - 3pm). Space is limited to just a few booths and about 10 spots at the counter so you may have to wait a little on the weekends for a spot but it won't be packed like Mickey's in Madison. 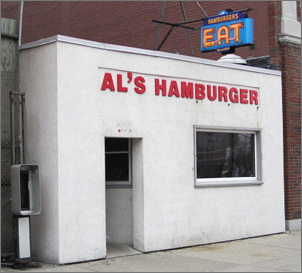 Do yourself a favor, eat at Al's. This is not the kind of place that you want to go to before an event, you will definitely walk out smelling like a deep fried mess however: the burgers are tasty. BUT - the corned beef hash is to die for!!! You have to get there pretty early on a Sunday or it might be all gone: some serious hangover food! I went for lunch at one of the oldest diners in Green Bay, Al's Hamburger, which is located on the east side in downtown Green Bay. It was established in 1934 and is still in the same location and run by the same family. They serve breakfasts, lunches, and dinners and are especially known for their great hamburgers. It is a very small restaurant for seating; there are only fifteen stools by the counter and three small booths. The inside looks to still have all of the original interior and is kept clean. The booths are laminated with orange red color tops which match the color of the stool tops. There are condiments on each booth, a large sugar dispenser, a napkin dispenser, salt and pepper shakers, jelly packets, and plastic squirt bottles of ketchup and mustard, but FYI, even though the mustard squirt bottle is yellow they have them filled with spicy brown mustard. It is a very casual and friendly atmosphere with a mixture of clientele from professionals to blue collar. The server came very quickly to wait on me and told me of their homemade soups of the day and their features of the day. One of the featured sandwiches that day was a summer sausage sandwich for $3.75. I came to lunch to try one of their burgers so I ordered the Al's hamburger which is a half-pound burger for $5.oo with fried onions and a freshly brewed glass of ice tea for $1.25. My hamburger was fried on a griddle out in the open right behind the counter. For background music they had the radio on with the top 40 and adorning the wall were old pictures of customers from many decades ago along with a few Packer players. My hamburger was severed in a plastic basket with a paper liner and with a few dill pickle slices on the side. 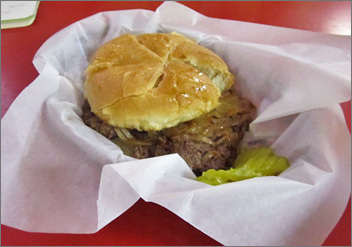 The hamburger was a hand formed patty placed on a large white bun. The burger was definitely a full half pound of meat no skimping here, the hamburger patty was so large it had a good inch of meat hanging over the sides of the bun. The meat was thick and juicy with a tasty seasoning on it, the hamburger tasted fantastic. There is nothing like a good hamburger on a seasoned griddle and cooked right. There was also a good amount of fried onions covering the burger patty. I definitely needed both my hands and lots of napkins to finish it. The service was friendly and efficient but please take note that Al's does not accept any type of credit or debit cards.